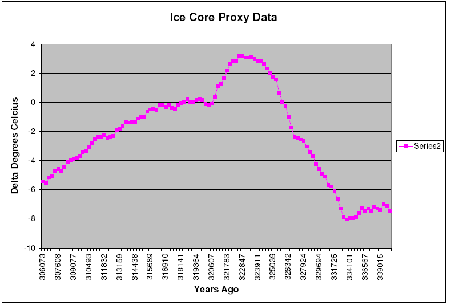 Ice core data. What does it really say? Lets take a look at what happened about 300,000 years ago. 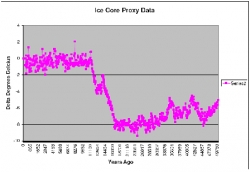 This chart shows us that about 333,000 years ago the climate temperature was 8 degrees cooler than it is now. Then it suddenly (in geological time) jumped up to about 3 degrees warmer than it is now, by about 323,000 years ago. So it took about 10,000 years to get 11 degrees warmer. Soon after that it started getting cooler again. In about 3000 years the temperature had fallen to what it is today, and it kept getting cooler, so that in 10,000 years it was down to about 2 degrees cooler than today. The charts show that there have been a number of temperature 'spikes' where the climate got very much hotter than average, and then cooled off again. This chart is an example of one of those events. Now lets take a look at another temperature 'spike' that is more recent. This chart is from about 114,000 years ago to 140,000 years ago. In this chart we see the temperature rising from about 9 degrees below today to 3 degrees above today in about 10,000 years. That's a 12 degree increase in about 10,000 years, similar to the 11 degree shift in 10,000 years 300,000 years ago. In about 2000 to 3000 years the temperature had dropped to what it is today, and then kept going down so that after 10,000 years it had fallen to about 2 degrees cooler than today. That is about the same thing that happened 300,000 years ago. 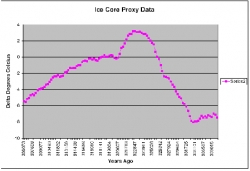 As this chart shows, about 17,000 years ago the climate temperature was about 9 degrees cooler than today. That is when the glaciers were munching up the area that we now call Chicago. Then suddenly about 11,000 years ago the temperature was up to Todays temperature. 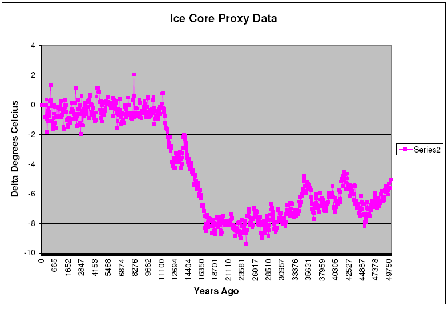 So based on what we saw previously we should at this point in time be a couple of degrees cooler than the peak temperature 11,000 years ago, but we aren't. Oh it has gotten a few degrees cooler, but then it gets a few degrees warmer, bouncing back and forth with the net effect of not changing much at all. The curve has been basically flat for 11,000 years. This hasn't ever happened before, that we know of, based on this data. Why? What is different now from then? Humans made a big change about 10,000 years ago. There are probably a lot of differences that I don't know about, but I can think of a few. One is that humans made a big change about 10,000 years ago or so. We started to farm. We invented agriculture. Did you know that the vast majority of plants and animals that we eat today didn't even exist 10,000 years ago? We created them through selective breeding and hybridization over these 10 millennia. That's a change, a big change, on this Earth. Is it big enough to keep the temperature higher than it should be? I dunno. It sure could be a contributing factor though. What else could be going on? Well, the sun is getting older, and as it does it is getting hotter. It will eventually get so hot and so big that it will swallow up the earth and incinerate it. But that is way off in the future. It has gotten a smidgen hotter though in the last few hundred thousand years. Is that enough to stop the predicted cool down? Again, I dunno. I would think, though, that it is also a contributing factor. We hear a lot of talk these days about the greenhouse effect heating up the planet due to high levels of CO2 in the atmosphere. I took a look at that too. The time period is so short that these charts don't have the resolution to say anything about that but there are a couple of inferences that we can make. One is that the recent CO2 increase due to industrial development could not have been the cause of flattening out the temperature curve because whatever caused that was in effect 10,000 years ago. The other thing, and I don't have the charts here to show it, (but I will get them and put them here) is the same data I used to plot these temperatures also show the CO2 level at that time. 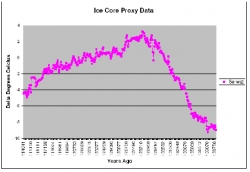 Time after time in the vicinity of the temperature spikes there was also a spike in CO2. Here is the strange thing. The CO2 spikes occurred AFTER the temperature went up. So it could not be the cause of it. 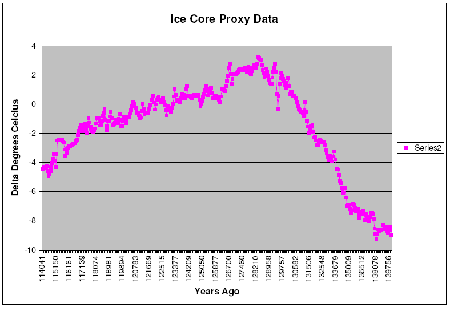 The increased CO2 was a result of the temperature increase (or a co-result) and could not have been the cause. Weird, huh? Weird as it is, that is what the data shows. So my conclusion is this ... well ... I have no conclusion. I don't believe this data is good enough or accurate enough to draw any clear conclusion from it. I do think, though, that it is food for thought. Climate is a chaotic process (thanks mainly to the strange little H2O molecule) and it will remain an enigma for many years to come. I am glad, though, that it isn't as cold as it should be. I would hate to see all the pretty things in Chicago (and all of Canada) getting mowed down by advancing glaciers.